It took me some time after seeing this motion picture to gather my thoughts on my perspective and what I thought did and did not work. Truthfully I am still doing this as I write. For starters, the plot summary is just about all there is to this film, which is based on the novel of the same name by Dave Eggers; whose name is also on the credits list for writing the screenplay. This is his second novel to be adapted to the screen (“A Hologram for the King”) of which Tom Hanks also starred. Then there is the direction of James Ponsoldt (2015’s “End of the Year”), which had me waiting for the end of the movie. 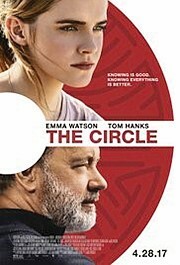 In the plot, Mae Holland (Emma Watson) seizes the opportunity of a lifetime when she lands a job with the world's most powerful technology and social media company “The Circle” and consequently joins a groundbreaking experiment that pushes the boundaries of privacy, ethics and personal freedom. Watson, in what is reportedly her last film of 2017 is a brilliant actress, but in this film is out of her element. She is way too talented for this role, thus the character was less than believable. The company’s founder Eamon Bailey is played by Tom Hanks. I kept waiting for that moment he would offer up a signature expression or gesture. It never came. More talent wasted. Although the film’s length was nearly two hours, I felt the overall appearance of these iconic actors were no more impressive than a cameo would have been. Still looking for bright spots, I remain unable to dig deep enough to come up with anything noteworthy. Even when an ally named Kalden, played by British actor John Boyega (“Star Wars: The Force Awakens”) encourages Holland to take action, the message he gives her is clear, but delivered without any real sense of urgency or impact. The first half hour of the movie was devoted to character recognition and introduction but that could have been accomplished in less time. Trust me, I looked at my watch. The rest was just one unimpressive moment after another. Thankfully when the end finally arrived, Watson did manage to save humanity from the impending doom. I only wish I was on that list.